The Dirty Little Secret of the Internet Jothy Rosenberg Chief Technology Officer & Co-founder November 2001. 5 No lock symbol means no security and no encryption. No one knows to click here. If anyone ever checked, the site business identity cannot be verified. Standard way to access a Web site via non-secure connection. Example: I want to book and buy a ticket on line. 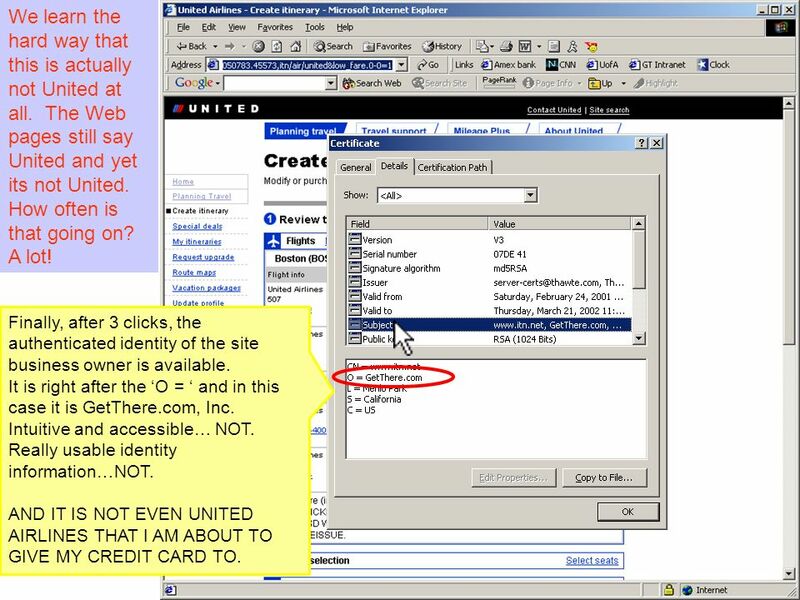 6 OK, Im ready to purchase and give my credit card – to United right? It really is United right? Lock symbol appears because I am about to enter credit card info but unbeknownst to most everyone, it is clickable Click-1 shows that this certificate was issued to www.itn.net. Who is this? And what do they have to do with United Airlines? Click on the Details tab to dig deeper. 7 You have to dig really deeply into crypto- arcanery to get to the identity information such as it is. 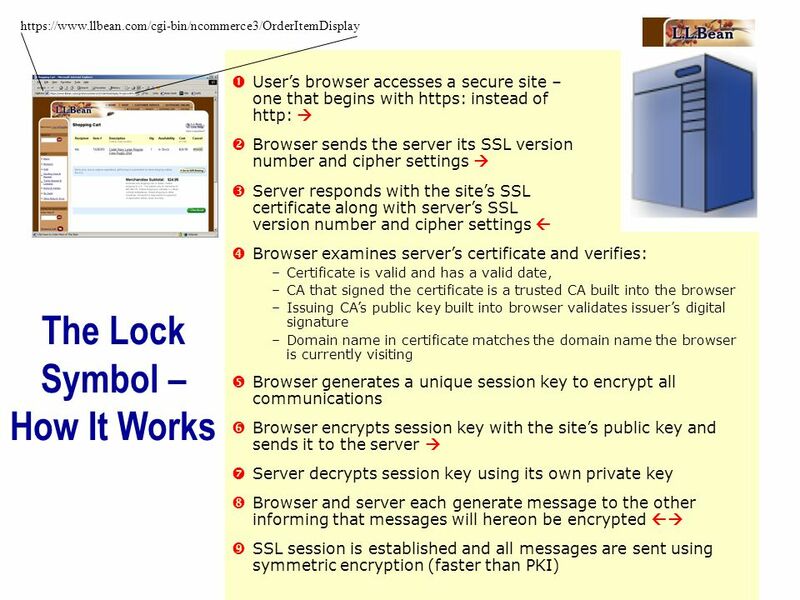 Click-2 gives access to the contents of the servers digital certificate. The site business identity is still not available. Click on the Subject field to dig deeper. 8 We learn the hard way that this is actually not United at all. The Web pages still say United and yet its not United. How often is that going on? A lot! Finally, after 3 clicks, the authenticated identity of the site business owner is available. It is right after the O = and in this case it is GetThere.com, Inc. Intuitive and accessible… NOT. Really usable identity information…NOT. AND IT IS NOT EVEN UNITED AIRLINES THAT I AM ABOUT TO GIVE MY CREDIT CARD TO. 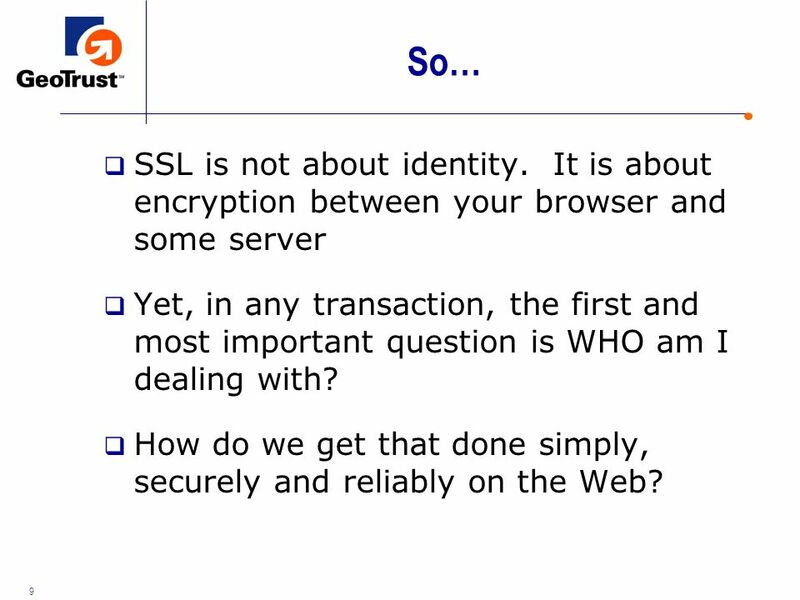 9 9 So… SSL is not about identity. It is about encryption between your browser and some server Yet, in any transaction, the first and most important question is WHO am I dealing with? How do we get that done simply, securely and reliably on the Web? 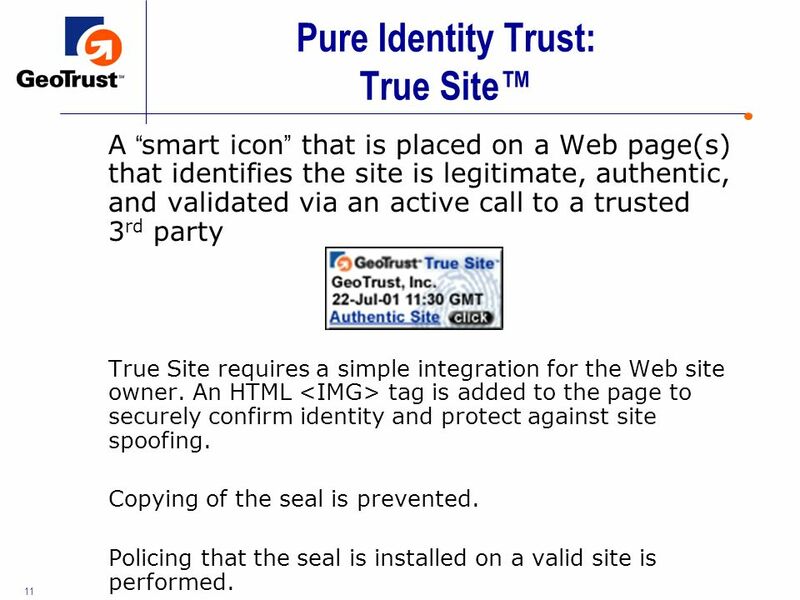 11 11 Pure Identity Trust: True Site A smart icon that is placed on a Web page(s) that identifies the site is legitimate, authentic, and validated via an active call to a trusted 3 rd party True Site requires a simple integration for the Web site owner. An HTML tag is added to the page to securely confirm identity and protect against site spoofing. Copying of the seal is prevented. 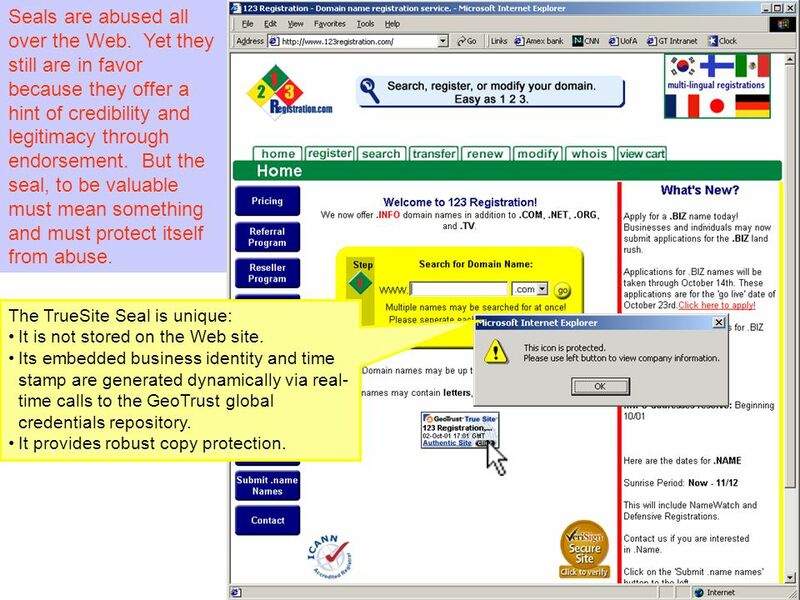 Policing that the seal is installed on a valid site is performed. 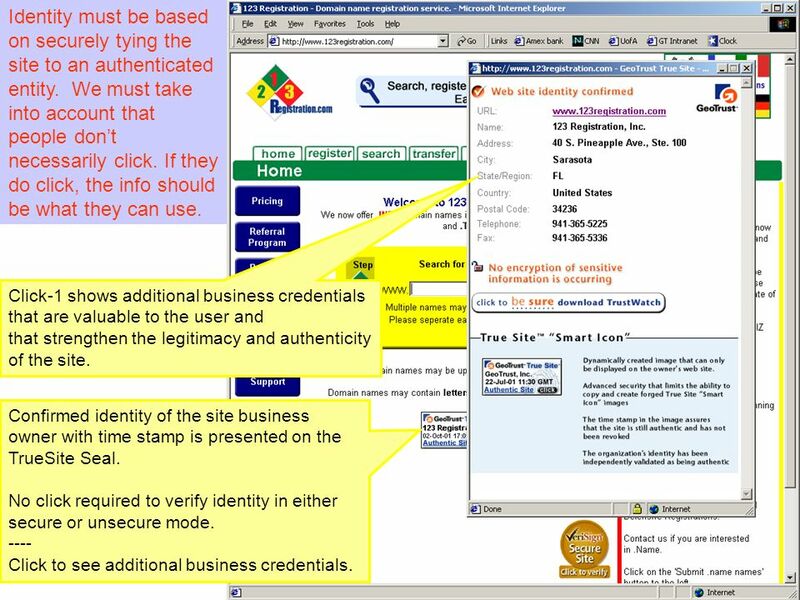 12 Confirmed identity of the site business owner with time stamp is presented on the TrueSite Seal. No click required to verify identity in either secure or unsecure mode. ---- Click to see additional business credentials. Click-1 shows additional business credentials that are valuable to the user and that strengthen the legitimacy and authenticity of the site. 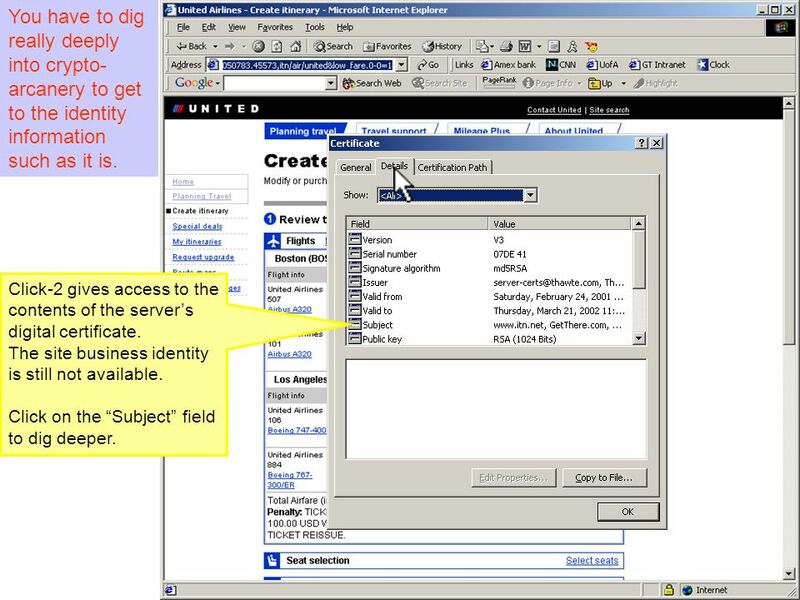 Identity must be based on securely tying the site to an authenticated entity. We must take into account that people dont necessarily click. If they do click, the info should be what they can use. 13 Any image on a Web page can usually be copied with a simple right click. This is how seals are stolen and put on any other site that has no right to them. This is why most seals have limited value and credibility. Its fundamental to the Web to be open. So normally, if you see it, you can copy it. And because seals are valuable to people, copy them they do. 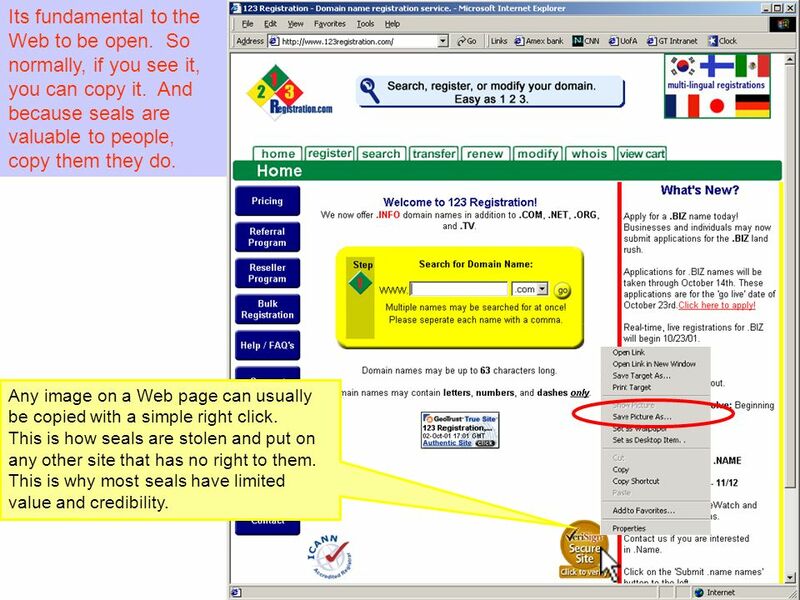 14 The TrueSite Seal is unique: It is not stored on the Web site. Its embedded business identity and time stamp are generated dynamically via real- time calls to the GeoTrust global credentials repository. It provides robust copy protection. Seals are abused all over the Web. Yet they still are in favor because they offer a hint of credibility and legitimacy through endorsement. But the seal, to be valuable must mean something and must protect itself from abuse. 16 Site spoofing – the whole sale copying of an entire site to a new location usually with changes consistent with the perpetrators goals – is prevalent. 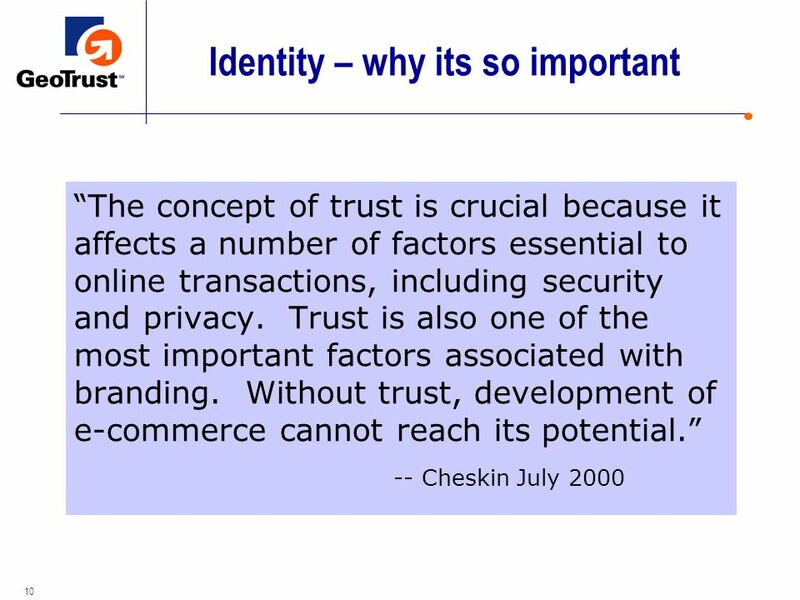 Identity trust will be lost if the mechanism does not protect against such fraud. 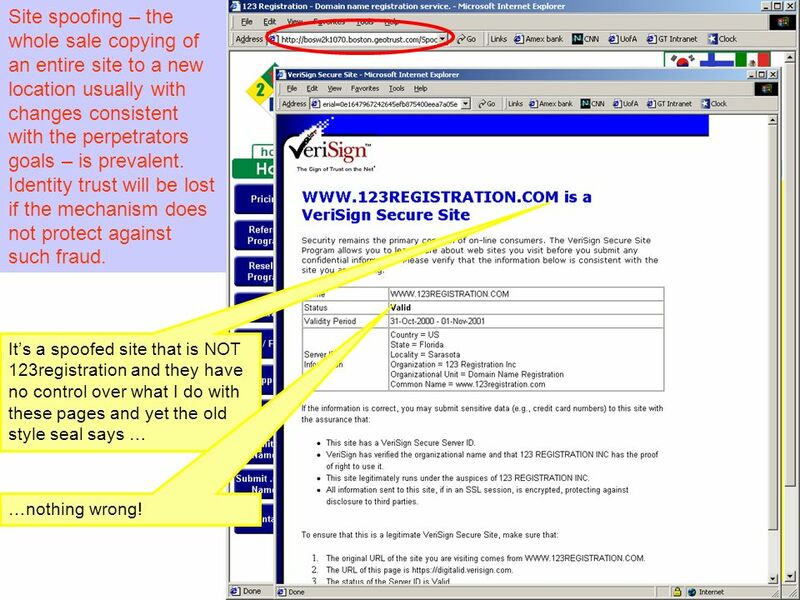 Its a spoofed site that is NOT 123registration and they have no control over what I do with these pages and yet the old style seal says … …nothing wrong! Download ppt "The Dirty Little Secret of the Internet Jothy Rosenberg Chief Technology Officer & Co-founder November 2001." Topic 8: Secure communication in mobile devices. Choice of secure communication protocols, leveraging SSL for remote authentication and using HTTPS for. DNS and HTTPs ACN Presentation. Domain Names We refer to computers on the Internet (Internet hosts), by names like: sharda.ac.in These are called domain. 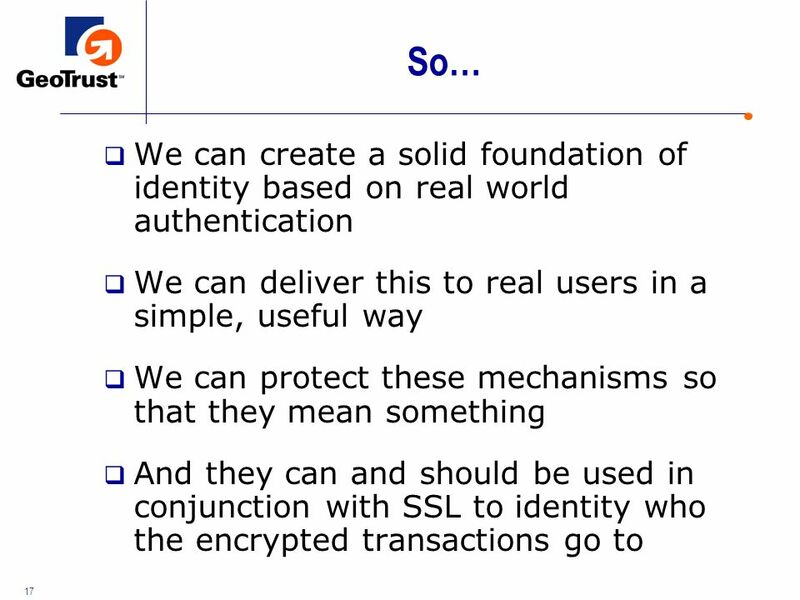 More on SSL/TLS. Internet security: TLS TLS is one of the more prominent internet security protocols. TLS is one of the more prominent internet security. 1 Supplement III: Security Controls What security services should network systems provide? Confidentiality Access Control Integrity Non-repudiation Authentication. Http Web Authentication Web authentication is used to verify a users identity before allowing access to certain web pages On web browsers you get a login. Secure Sockets Layer. 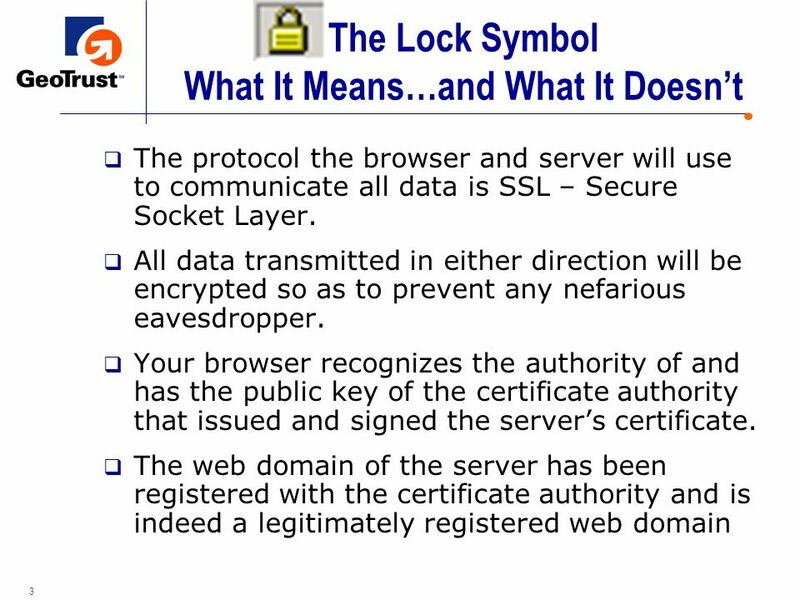 SSL SSL is a communications protocol layer which can be placed between TCP/IP and HTTP It intercepts web traffic and provides security. 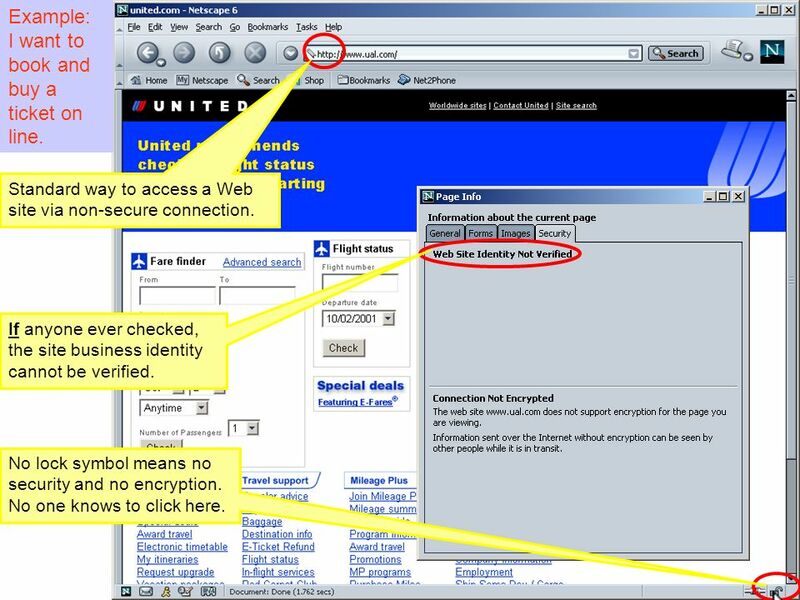 Mar 19, 2002Mårten Trolin1 This lecture On the assignment Certificates and key management SSL/TLS –Introduction –Phases –Commands. A Third Party Service for Providing Trust on the Internet Work done in 2001 at HP Labs by Michael VanHilst and Ski Ilnicki. 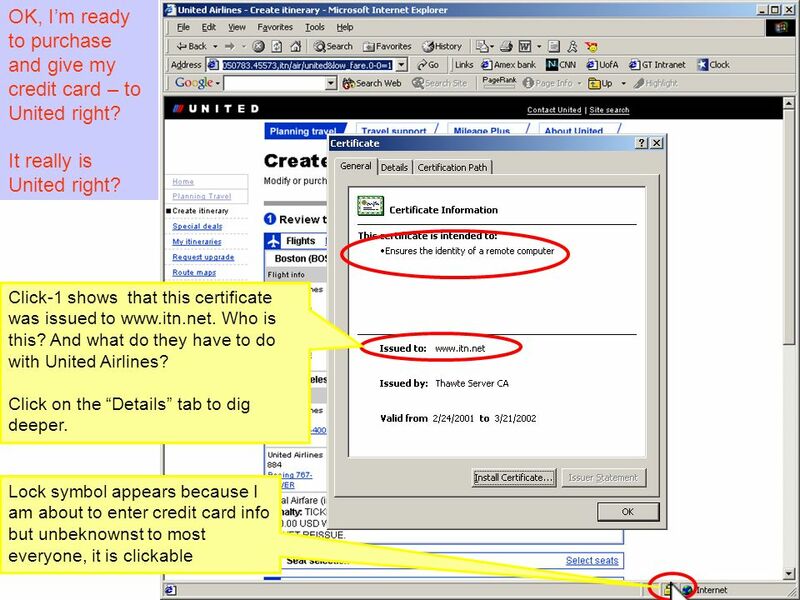 Mar 12, 2002Mårten Trolin1 This lecture Diffie-Hellman key agreement Authentication Certificates Certificate Authorities SSL/TLS. Chapter Extension 23 SSL/TLS and //https © 2008 Pearson Prentice Hall, Experiencing MIS, David Kroenke.